A brilliant Korean American researcher (Kim, 2002) found that self-talk improved American visual problem solving, and that preventing meaningful self-talk (by making the subjects repeat the alphabet) screwed things up, preventing Americans from solving problems. In East Asians however, she found that self-talk prevented visual problem solving, and that reciting the alphabet did not have a deleterious effect. She concluded that Asians are not thinking in language. We agree But Kim said little about the nature of East Asian thought. In this paper we hypothesized that Asians do not talk to themselves but show themselves pictures or imagine. We call this a "Nacalian" (Lacan reversed) transformation and we give experimental data to support it. We got Japanese to answer the second author's self-talk scale (Brinthaupt, Hein, & Kramer, 2009) (how much do you talk to yourself when….) and a modified version, the self-image scale (how much do you imagine things when…) and found that Japanese imagine more than they talk to themselves. 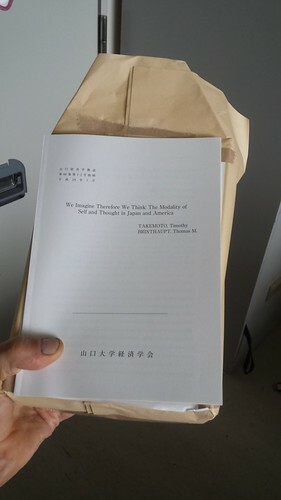 We reversed, or Nacalianly transformed, Kim's experiment (Kim, 2002), language for image, and found that imagination did not effect American subjects, neither for better, nor for worse if suppressed, but in Japanese imagining improved their ability to think up words, and repressing imagination prevented the same. We argued that this lent evidence for our hypothesis that Japanese think by showing themselves images as oppose to talking to themselves. 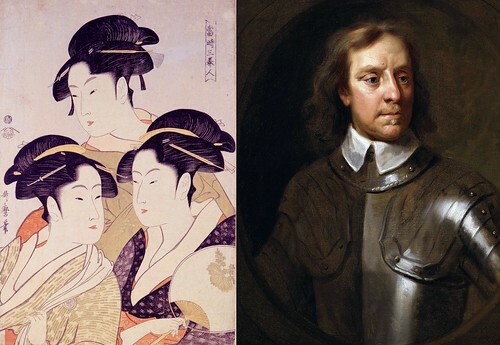 We then discussed the implications for (A) the nature of thought and (B) Japanese culture. A) Recently thought as self-speech has come under attack (Freud, Left Brain Right brain work, Libet, Nisbett and Wilson) from evidence to show that the reasons that people give for their behaviour are generally bogus, and thoughts are generated after the decision making event. Westerners think our thoughts cause our behaviour, but they do not. "Thoughts are the product, not the process of thought". So why do we have thoughts? Recent psychologists such as Johnathan Haidt (who is brilliant) argue that thought is excuse preparation. We talk to ourselves so as to work out justifications for our actions to say to others. Thinking is for speaking they claim. However, if Japanese are thinking in pictures, then this communicative theory of thought seems untenable, at least in the Japanese case, since pictures are difficult to convey to others. So what is thought for? We argue that Higgins (1996) notion of thought as a way of becoming emotionally involved and therefore motivated by ones actions is appropriate explanation for thought. Both talking to oneself and showing oneself pictures is a way of mirroring oneself, like standing in front of mirror, or standing on scales (c.f. “the weigh yourself diet”). If you represent yourself to yourself, you try harder. B) The Japanese are seen as lacking in thought, self and individuality because researchers are always paying attention solely to language. But if you look at the Japanese, their houses, cities, cars, clothes, TV, behaviour, then you see that they are bristling with creative, innovative thought, and individuality. Brinthaupt, T. M., Hein, M. B., & Kramer, T. E. (2009). The self-talk scale: Development, factor analysis, and validation. Journal of personality assessment, 91(1), 82-92. Higgins, E. T. (1996). The" self digest": self-knowledge serving self-regulatory functions. Journal of personality and social psychology, 71(6), 1062. Perhaps the offprints will be valuable one day! They are free now. In recent research (Takemoto, 2017 in Japanese) I have argued that the size and positivity of self-drawings are a better measure of Japanese positive self regard that self-esteem scale scores and found that self-drawing size correlates with perceived social support in Japanese males, and that positivity of self drawing (as measure by independent evaluators) correlates with perceived social support in both Japanese male and female students, whereas self-esteem is not predictive of social support at all. In the vernacular, Japanese people who 'stand tall' with good comportment and positive, large body image are popular, but people with 'big mouths' and high self-esteem are not especially popular at all. In a recent esteemed study (Bai et al., 2017), in the most impactful social psychological journal, a similar result was hidden in a paper on "awe". 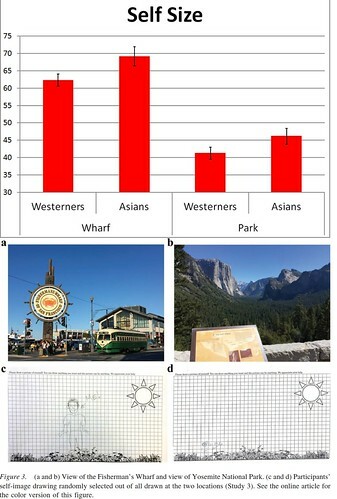 First of it reported that in an initial 7 item scale selection of self-size, where participants were asked to circle a self-drawing that was appropriate in size to themselves from large (like the above bottom left) or small (like bottom right) was found to correlate strongly with linguistic measures of, above all self-esteem (r=.64**), perceived power (r=.61), general self-efficacy (r=.5**), sociometric-status (r=.47**) and self-entitlement (r=.2**) but not with height nor weight. The fact, however, that Asian perceived self-sizes, when measured with a self-drawing at least, were larger than those of Westerners hardly receives attention at all, hidden as it was in considerations of "awe," which Westerners are more sensitive to, in Yosemite Park for instance. May the Gods of social psychology forbid that Asians are ever found to be more positive than Westerners! The above graph shows the average number of squares covered by self drawings adapted from Table 2 (Bai, et al., 2017 p.6) where Westerners are the average of North American and European respondents. The same pattern was found for the size of "signature" (me,　我, 私）but since this will depend upon the script only in-country correlations would be meaningful, and provides an interesting connection between Asian self-esteem and calligraphy. For how much longer will Asian visual positivity remain hidden? It will not be long now. The problem then arises, if the self is both linguistically and visually represented, who is it represented to? Recent research (Boothby, Clark, & Bargh, 2017) has found that Americans believe that everyone looks at objects about equally but that they observe others more than others do, and about twice as much as others observe themselves, even though this is not the case. The authors termed this bias the "invisibility cloak illusion" since the data implies that we feel ourselves to be invisible, or indeed that we are invisible to ourselves as hinted at by some researchers (Smith, 1827; Rochat, 2009). This result is unlikely to be universal. Research by myself and colleagues (Heine, et al., 2008) has shown that Japanese are chronically visible to themselves at least in terms of simulated mirror images. In other research we (Takemoto, & Imamura, 2001) have shown that schizophrenics are better at judging the size of their extremities than those without schizophrenia, judging hand sizes almost exactly at a typical 30cm viewing distance, and at 2 metres, whereas non schizophrenics judge hands to be 10-15% smaller than they are. This suggests that the bodies of schizophrenics at least are not invisible to themselves as also suggested by some schizophrenics (Pans Disease, 2017). The misjudgement of hand sizes, but not bank notes, was found among Japanese participants who judged their hands to be up to about 15% smaller than in reality, possibly due to the fact that they identify with their mirror images, which they often do not see as being left-right reversed (Takano & Tanaka, 2007). I predict that the invisibility cloak illusion (Boothby, Clark, & Bargh, 2017) will be absent among Japanese. Indeed the Japanese may feel that they are observed by others more than they observe others themselves. Further I feel that the researchers would profitably have asked two more types of question, "how often do you/others (simulate) observing yourself/themselves?" which would show a greater cultural difference being the lowest type of observation in the West, but perhaps having the highest reported/estimated incidence in Japan. Image reproduced without permission from Boothby, Clark, and Bargh (2017, p. 9). Should you wish that I cease an desist please drop me a note in the comments or by mail to the email link at nihonbunka.com. Boothby, E. J., Clark, M. S., & Bargh, J. A. (2017). The invisibility cloak illusion: People (incorrectly) believe they observe others more than others observe them. Journal of personality and social psychology, 112(4), 589. Rochat, P. (2009). 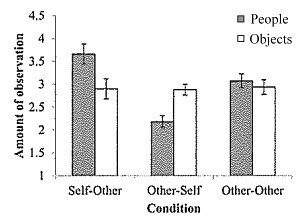 Others in mind: Social origins of self-consciousness. Cambridge University Press. Takano, Y., & Tanaka, A. (2007). Mirror reversal: Empirical tests of competing accounts. The Quarterly Journal of Experimental Psychology, 60(11), 1555-1584.